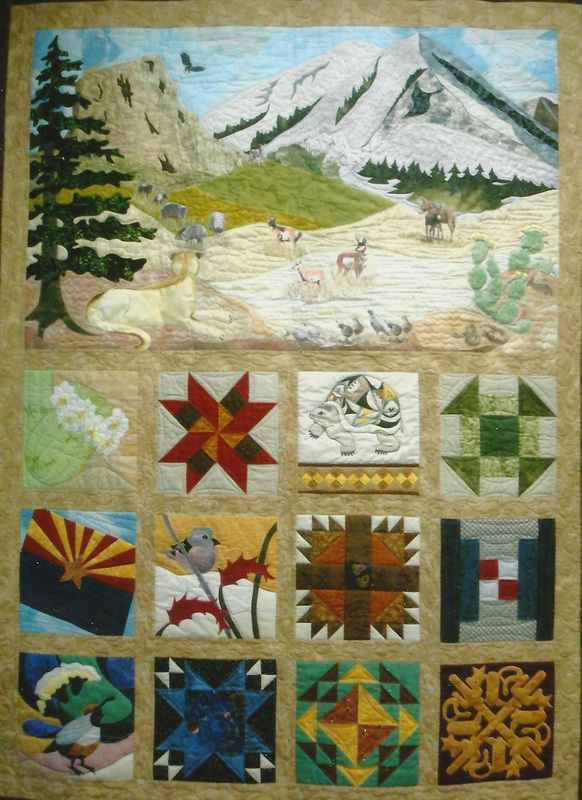 "Yavapai Memories," was designed by Lucille Hurley from her own design, and inspired by the landscape and cultures of Yavapai County, Arizona. 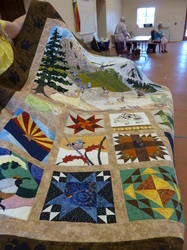 Each Friendship group helped in making this original quilt design. Cindy Phare quilted design. 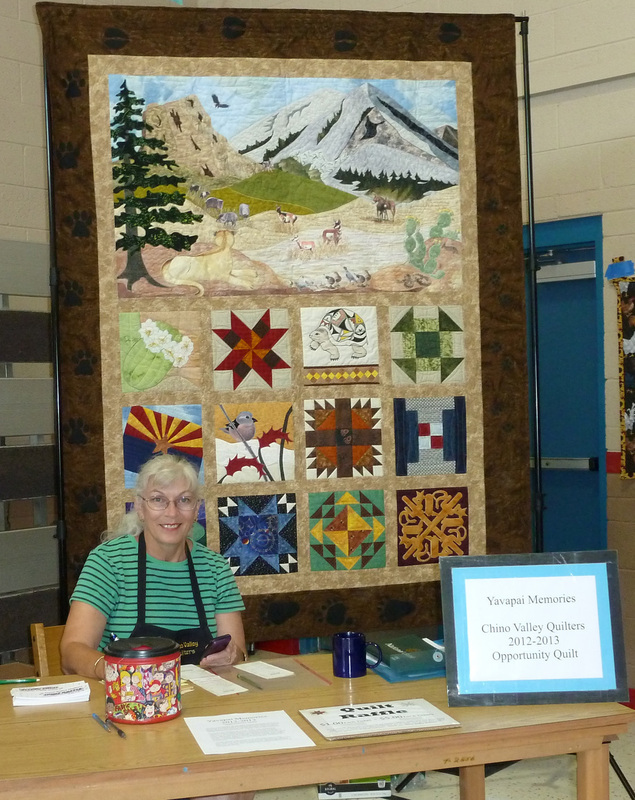 Quilt designer, Lucille Hurley, proudly display the beautiful quilt she designed and worked on with the Chino Valley Quilters guild members. 2012 Yavapai Memories Opportunity Quilt - Winner announced! 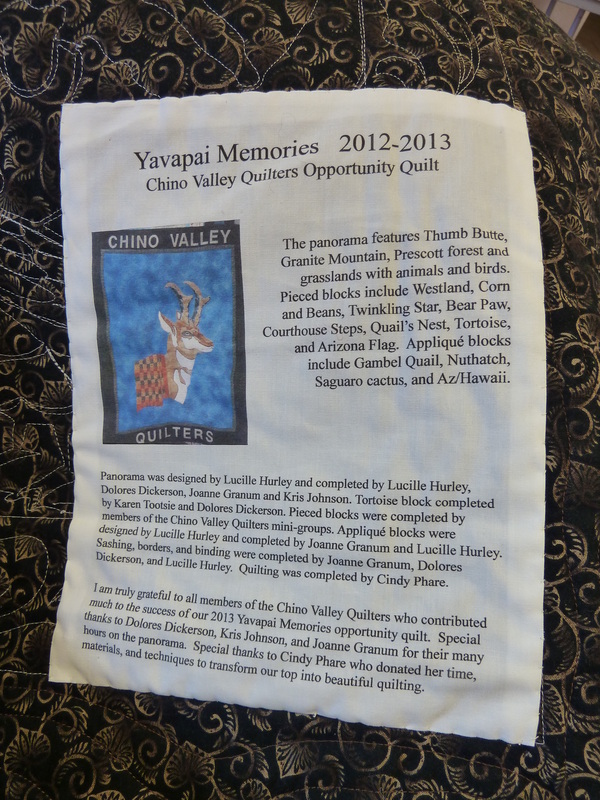 The drawing for the winner of the beautiful 2013/2014 Yavapai Memories opportunity quilt was held at our October 8, 2013 meeting. 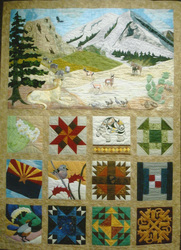 Congratulations go out to Carolyn Sadler, who is from Texas, as the winner of the Yavapai Memories quilt. Lucille Hurley drew the winning name and after confirming the winning ticket, the quilt was promptly mailed off to Carolyn. 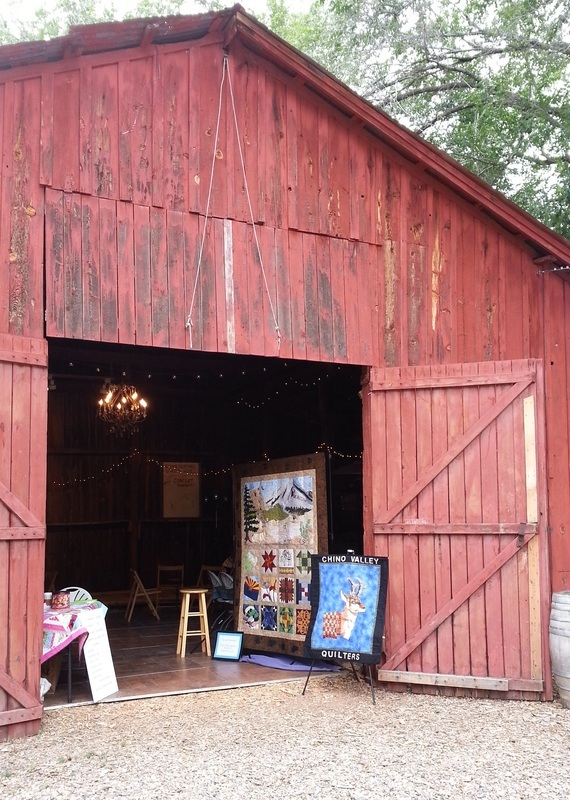 She is so proud of the quilt she immediately hung it in her home. Congratulations again Carolyn and we sincerely hope you enjoy the quilt as much as we did while we had the wonderful quilt in our possession! Thank you again to everyone who purchased tickets for a chance to win! 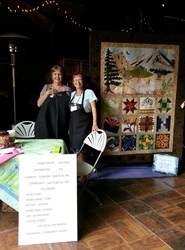 Our Opportunity Quilt is a special quilt project created by a different Chino Valley Quilters member. We will soon be presenting another opportunity to win our next exciting quilt. 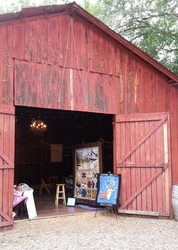 Our 2014/2015 opportunity quilt will be unveiled at our October 2014 Fall Harvest of Quilts show along with all of the details. 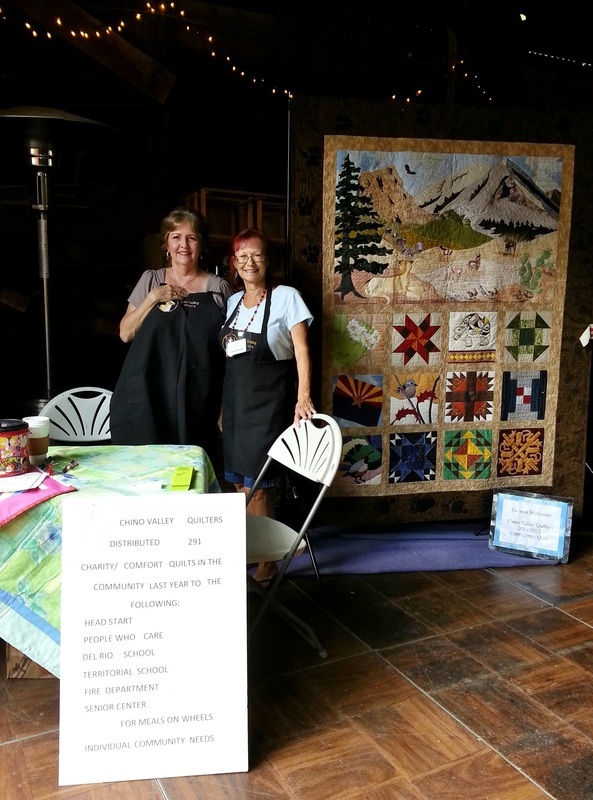 Chances to win are sold throughout the year or more prior, when members take the quilt on the road to display at various quilting and community events. The quilt has been displayed in Prescott, Phoenix, Prescott Valley, Lake Havasu City, Peoples Valley, Flagstaff and, of course, Chino Valley Arizona. Funds raised go toward supplies we use to make Comfort Quilts and to support our work with local charities and community organizations. In 2012, this helped Chino Valley Quilters donate nearly 300 quilts to area children, families, veterans and others. Our Opportunity Quilt is a special quilt project created by a different Chino Valley Quilters member every other year. 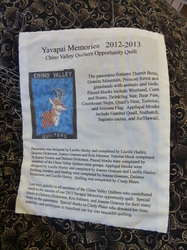 "Yavapai Memories," the 2013/14 Opportunity Quilt, was created by Lucille Hurley. 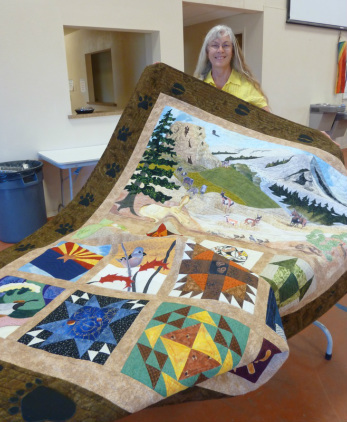 Inspired by the landscape and cultures of Yavapai County, Arizona, the quilt features traditional and original blocks and a pattern designed by Lucille. 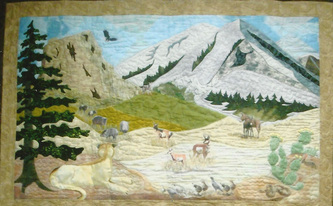 Custom long-arm quilting was done by Cindy Phare, owner of Sew Many Horses. This year the Opportunity Quilt will be raffled off through a drawing held at our October 2013 meeting. 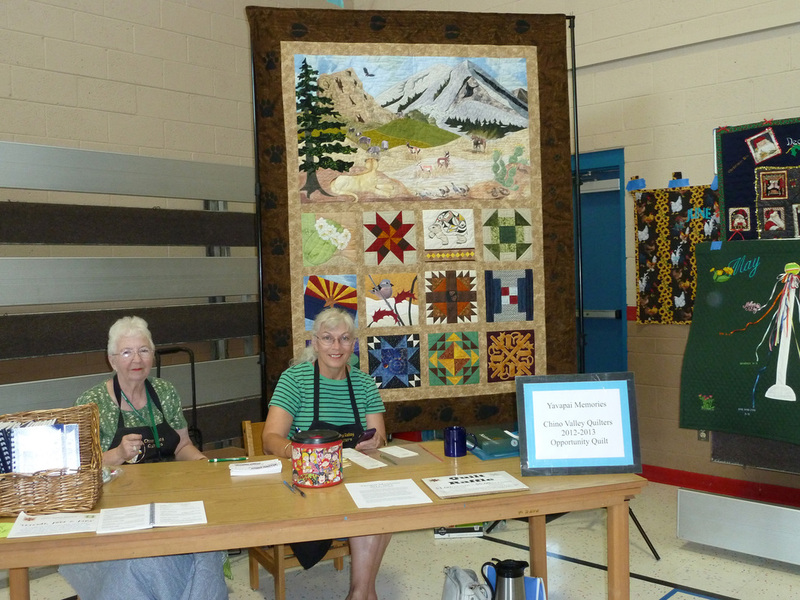 Chances to win are sold throughout the year or more prior, when members take the quilt on the road to display at various quilting and community events. Funds raised go toward supplies we use to make Comfort Quilts and to support our work with local charities and community organizations. 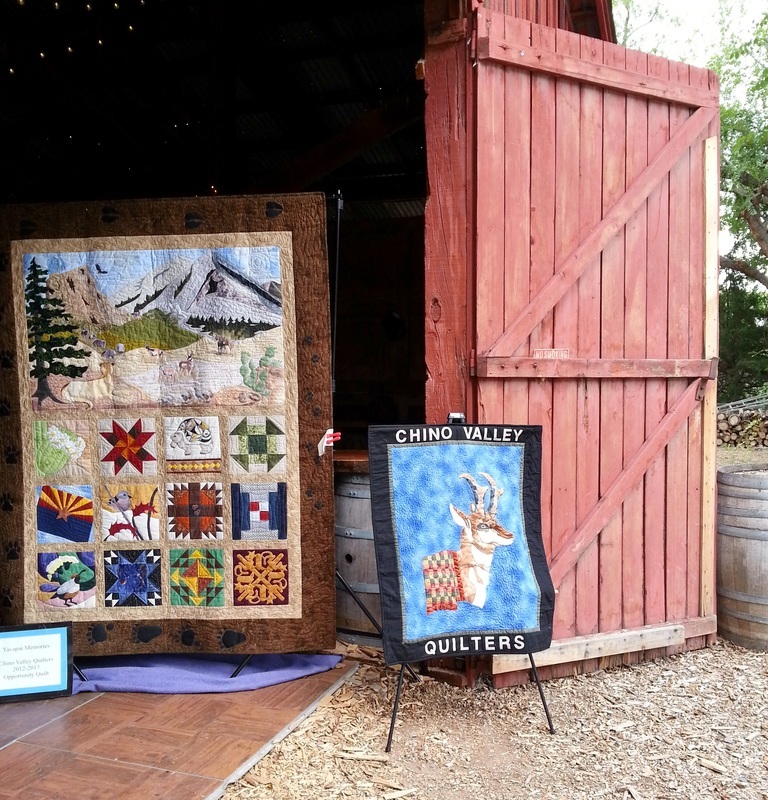 In 2012, this helped Chino Valley Quilters donate nearly 300 quilts to area children, families, veterans and others.